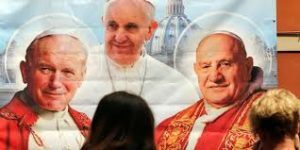 But if you recognize the post-Conciliar popes as true popes — Successors of St. Peter and Vicars of Jesus Christ on earth — there is no room whatsoever for you to challenge the validity of the canonizations that they solemnly promulgated. The illogic in the SSPX position is not lost even on simple lay people. Just a day or two ago, I was talking to a Catholic mother who teaches her kids religion out of the standard high school text My Catholic Faith — a pre-Vatican II work, incidentally, republished by SSPX in the United States. 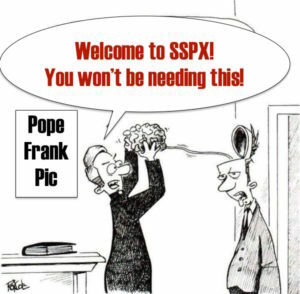 The incoherence of the SSPX position was highlighted the very next day in the Society’s promotional material for a new book, The Realist Guide to Religion and Science, by Rev. 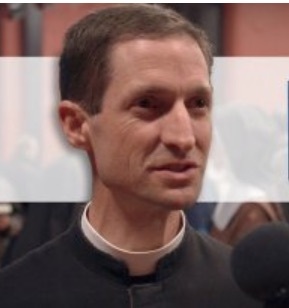 Paul Robinson SSPX. Well of course Fr. Haffner regards JP2 as a saint — because when a pope says someone is a saint, that’s what he is! It’s standard pre- and post-Vatican II doctrine. The irony here — a non-trad clergyman takes for granted a traditional teaching that SSPX explicitly rejects — should be obvious. Since “deviation” from the party line is always a crime, whether in Mao’s China or the SSPX, this profession of faith was intended, no doubt, to head off a phone call from Menzingen, announcing to the good Father that he’d been selected to found a mission in Sudan, so could he please get his malaria and anti-dysentery shots topped up. And this is how it’s always been in SSPX: You follow the “line” of the Society — as enunciated by Abp. Lefebvre in my day, or Bp. Fellay in our own — as the correct position on any one of dozens of the difficult issues that faithful Catholics face in the post-Vatican II era. You affirm when the Society affirms, deny when it denies, and if its position zig-zags on one day to contradict what it said the day before, you pretend not to notice — knowing that those who show loyalty to any principle beyond the “position of the Society” du jour soon find themselves on the outside. But there is no substitute for the Magisterium. And those thousands and thousands of souls who now blindly follow the “positions of the Society” and have checked their brains at the door will end up preserving not Catholicism or the Church, but the mentality of a cult, where Il Duce ha sempre ragione — the Leader always knows best. Support St. Gertrude Bishop’s Apostolate with each purchase you make through the Amazon Smile Program. It’s easy! This was written by Rev. Anthony Cekada. Posted on Thursday, March 1, 2018, at 3:50 pm. Filed under Francis / Bergoglio, Lefebvre, SSPX: Errors, SSPX: Misc. Bookmark the permalink. Follow comments here with the RSS feed. Comments are closed, but you can leave a trackback.